کمپانی فنلاندی نوکیا بتازگی گوشی دو سیم کارت خور نوکیا مدل 208 را عرضه کرده است. The affordable 208 dual-SIM handset is one of the many feature-phones announced by Nokia this year. The Finnish company confirmed back in July that Nokia 208 will be available worldwide at the beginning of the same month. In addition, Nokia stated that there would be two 208 models to hit shelves in July, and one of these versions has just arrived in India, the dual-SIM variant. 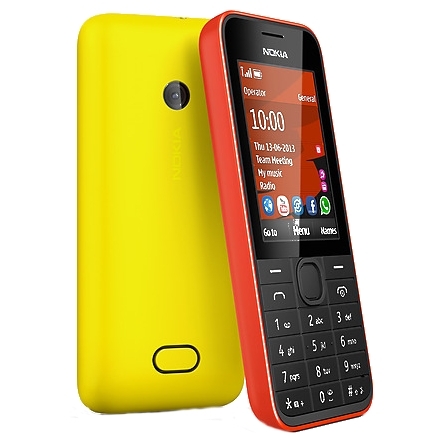 Nokia 208 is one of the few feature-phones launched by Nokia that supports microSIM. Aside from that, there’s nothing that would make it standout from other affordable feature-phones available in India. As fonearena points out, Nokia 208 Dual-SIM is now available for purchase via several major retailers across the country for only Rs 5,299 outright, which is about $80 or €60. Customers get to choose from various color options, including Black, White, Cyan, Red and Yellow. Keep in mind that Nokia 208 features dual standby support along with dual-SIM Easy Swap technology, which allows users to switch SIM cards without having to power off the handset. The phone runs Nokia Series 40 user interface and sports a small 2.4-inch display that supports 240 x 320 pixels resolution and 262K colors. According to Nokia, the phone’s 1020 mAh Li-Ion battery should provide users with up to 490 hours of standby time (500 hours in 3G mode) or up to 12 hours of talk time (4.5 hours in 3G mode). Besides offering dual-SIM support (GSM + GSM), Nokia 208 comes equipped with HSDPA (7.2Mbps) and HSUPA (5.76Mbps) connectivity and Bluetooth 3.0. On the inside, Nokia 208 Dual-SIM features 64MB of RAM and 256MB of storage, which can be further expanded up to 32GB via microSD memory card. There’s also a sub-par 1.3-megapixel photo snapper on the back, which offers QVGA video recording at 15fps. Other highlights of the phone include Stereo FM Radio, Slam service, as well as Facebook, Twitter and WhatsApp applications.